Film Nerd is a little place on the internet for people who obsess over the smallest details of cinema. There Will Be Blood is very loosely based on the Upton Sinclair novel OIL!, in fact, if Paul Thomas Anderson wasn’t such a swell guy, he probably could have gotten away with not citing the novel at all. That being said, the novel’s version of Daniel Plainview, named J. Arnold Ross, was actually based on the real life of oil baron lunatic Edward L. Doheny. Edward Doheny built the Greystone Mansion for his son, Edward L. Doheny Jr, for 3,000,000 and then sold it to him for $10. It is in the halls of this very home that some of the most iconic scenes in There Will Be Blood were filmed. The scene below, featuring Daniel and H.W. in their final moments together, was filmed in the study of the home where the real life H.W. murdered his friend, his secretary, and then himself. AVC: That was actually shot at the Doheny mansion, right? Was it ghostly? PTA: It was great. It was funny, because that mansion has been used so many times in films; it’s kind of this notorious location. Your first instinct as a filmmaker is, “Can we really shoot someplace that’s been shot in so many times?” I think we had a free pass because this was the guy we were basing the film on. It’s definitely pretty ghostly around there, without question. Daniel called it a pyramid that Doheny built to himself. I think that fits. It’s kind of a mad place. 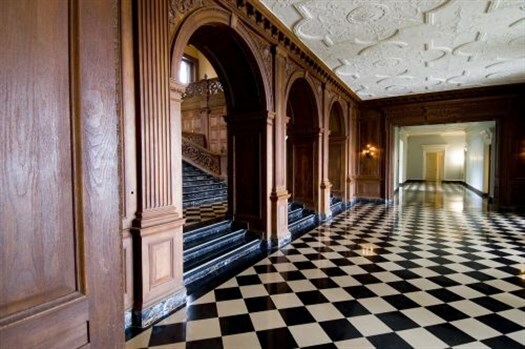 The Doheny Mansion is a completely different place, in which, There Will Be Blood did no filming. 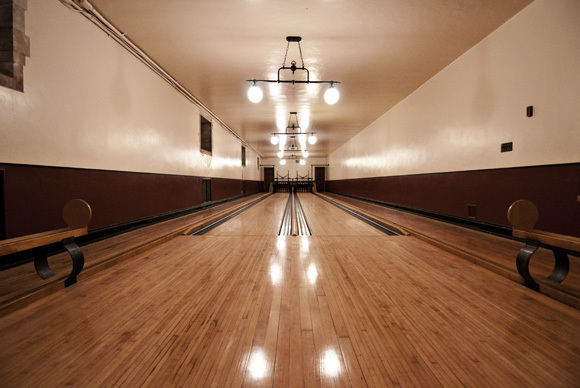 The stills below show Greystone’s bowling alley used in arguably the most iconic scene filmed in the last 20 years. The Kubrickian quality of the location is immediately apparent, making this the most ideal location for filming. So, there you have it. There Will Be Blood was filmed in the actual mansion built by the man Daniel Plainview is based on. The nature of young Edward Doheny Jr’s murder/suicide has never been made public, in much the same way we can assume that Eli Sunday’s head bashing never made the papers in Daniel Plainview’s world. David is Senior Editor and founder of Cut Print Film. His hobbies include watching movies and then writing about them on this site. David has a B.A. in English Literature and a B.K. down the street from his house.